I’ve long admired many patterns by Named Clothing, and yet it’s taken me until now to make any of their designs. It’s silly, because they draft for a taller woman, and I definitely fit that demographic. Well, aside from my weirdly petite upper body… totally out of proportion to the rest of me. Anyhoodle… I picked up the Alexandria Peg Trousers when they had a sale a few weeks back. 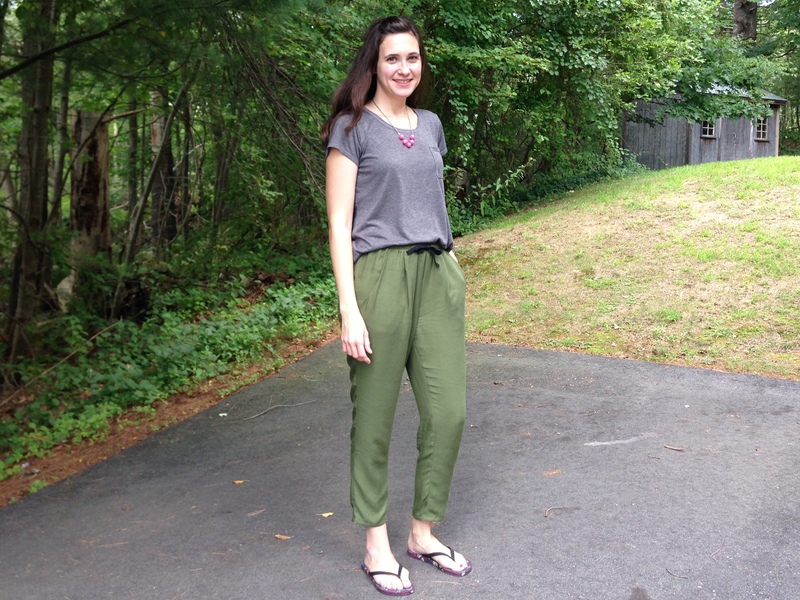 I’ve made True Bias’ Hudson Pants and I wear them all the time (oops, never blogged! ), so I thought a less sweat pant looking alternative would be really nice for actually leaving the house in. I found a rayon twill at JoAnn’s in a nice olive color and thought they would be a perfect match. First a bit about the pattern. I got the .pdf version, which includes two sizes per file (you get all the sizes, they’re just not nested like other patterns) with seam allowances included. I thought it was pretty handy to have the SA line drawn in, as I typically need to grade between different sizes for the waist and hip. I lucked out in that the two sizes I needed happened to be in the same file, so it wasn’t all that difficult to compare the two and make the necessary alterations. Even though it should have been simple I made it as complicated as possible. Way to go, self. For the back piece I took width off at the outer seam from waist to hip, then at the CB seam from the waist to maybe 4″ or so down (just above the bum, since i need plenty of room there). Then the front piece is where I made things difficult; sine there are pockets and pleats it was kind of a mind-bender as to where to grade in or out. But if you need to grade down for the waist, just take the extra width off the side seam (most of which is pocket) from waist to hip and call it a day. The pocket opening is far enough in from the side seam that you won’t mess up the proportions. My fabric (rayon twill) was a real pain to work with; it’s nearly impossible to cut on grain, it’s shifty, it’s fray-prone, and stretches out of shape easily. It has so much drape that the fabric itself kind of bags out under its own weight. Because of that, the pants seem to have drag lines all up and down the seams. Kind of a bummer really. To be honest, I was super unhappy with the pants when I tried them on mid-construction as I was testing the elastic length. The rise was so high, they looked like clown pants! I tossed them aside for a few days as I contemplated whether or not to even finish them. Buuuuut I really, really hate to leave projects unfinished, so I decided to try and save them. I basted the pleats down to keep them in place so I could lower the rise. I cut 1″ off the front, tapering to 1/2″ at the back (I usually need to add extra to the back rise for boo-tay coverage, otherwise I would have done 1″ all around). I cut a new waistband, which I made about 1/2″ longer to compensate for the lower rise. I finished the pants, tried them on and was so much happier with them! Completely turned around how I felt about these pants. However, even though I’m happy with how they look on me, they’re still oddly restrictive when I sit. I have to kinda pull the legs up to sit down, then they’re a little snug in the thighs, and tight at the knee and calf. It’s possible I should have lengthened them (I’m 5’8″—most of my height being in my legs…) as I don’t think I have particularly large calfs (13.5″). So in the end I have mixed thoughts about these pants, just not for the reasons I anticipated while I was in the throes of construction. Ultimately, I don’t think I’ll return to this silhouette in a woven fabric, but rather stick to knits. Now to switch gears… The tee I’m wearing is a Grainline Studio Scout Tee, made in a rayon/poly blend knit. The poly is a bit eh but I super love this tee anyway. I think for a slouchy tee, the scout will always be my go-to pattern. The only thing I did differently here was scoop the sleeve hem up slightly at the center (3/8″ or so) so it doesn’t sit as straight across. Then I used my possibly favorite neck binding method of sewing the binding to the right side at a 1/2″ SA, then pressing the binding up and around the raw edge, then top stitching in place. I think this looks better than a banded finish, and involves less guesswork regarding how long to cut, or how tight to stretch the binding strip. All in all, I’m pleased with my experience with Named patterns, and I look forward to making more of their offerings. I’ve seen the Inari tee/dress made up so many times (and I love every one) that I really want to give it a whirl. And they have new designs coming out very soon… can’t wait to see what they’ll be releasing! I love this whole outfit! Fromt he start of the post, I was wondering what the tee was and hoping it was me-made – you are making me want to sew up a few more scouts! I do like my knit versions of it a lot. I think the pants look really nice one you, but sounds like they are a bit of PITA to wear! One can never have too many Scout tees! I think it has such a nice fit around the shoulders, bust, and arm hole that you just can’t beat it for a flattering loose tee. Thank you! You look very current, that style of trouser is all over the shops now, the ones I’ve seen mostly having gathered cuffs at the hem. Love the scout tee, that style is also is very up to the minute. You look great in your outfit and although the twill was a ‘mare to sew it has the right drape and is exactly the fabric that rtw are using. I’m quite in love with this style, so I hope to add another of some variety to my wardrobe. I was scouting Anthropologie the other day and noticed they had a few with a gathered cuff—very cute. Next time I use this fabric I’ll come armed with some spray starch! Those pants are great! I hope you can make them with a different fabric (having a bit of stretch) or alter the size to be totally comfortable, because it would be unfortunate not to have this style in your wardrobe. They really suit you! Thank you! I was pleasantly surprised how much I liked the style after my initial impression. Looking quickly at other people’s versions, the hem hits a bit longer than it does on me. Perhaps lengthening above and below the knee will help with the tightness. If the right fabric comes along I’d be tempted to give them another shot! These pants look fab. Funnily enough I’ve just made pants too! However mine are the Papercut Patterns Guise Pants. I did consider making these but I had the Guise so decided to give them a try. I found the Jamie Jeans lower leg very narrow. In fact it was a wiggle to get them over the foot/ankle – perhaps it’s a peculiarity of their block? Despite the dramas… they look great. And olive + rayon sounds like heaven to me! Pants are about the one thing lacking in my wardrobe, so hopefully I can remedy that! The Guise pants are super cute… I need to check out your post. And thank you, these are super soft, I just wish they were more comfortable for lounging! The whole outfit looks great. I sympathise with you about the pants not feeling comfortable. Don’t give up though have another crack at them but in slightly stretchier fabric. They might turn out great. Thank you! I also think lengthening them would help. Given my longer legs the knees and hem may be hitting higher on me than intended. If the right fabric comes along I’d probably give them another shot! I made a pair of these the other day, I had put off making them as I thought I had the completely wrong figure for them, but surprisingly they are perfect on me. Yours do look great and so does the shirt. This style seems to look great on a lot of different figures! I was a little uncertain given my pear shape, but I was pleasantly surprised. Thank you! I love this outfit on you! I haven’t made a knit Scout yet– I need to add that to my sewing to-do list. The pants really look nice on you and are such a great color! It’s too bad they’re standing only pants. I have some stretch chambray that I am planning to use for woven Hudson pants. I’m hoping that the stretch will help me not feel like I’m wearing a sausage casing when I sit down. You’d love the scout tee in a knit—it’s just so flattering! And I really wish these pants were less restrictive, but then again, I have many “standing only” days :). Chambray Hudson pants sound fantastic! 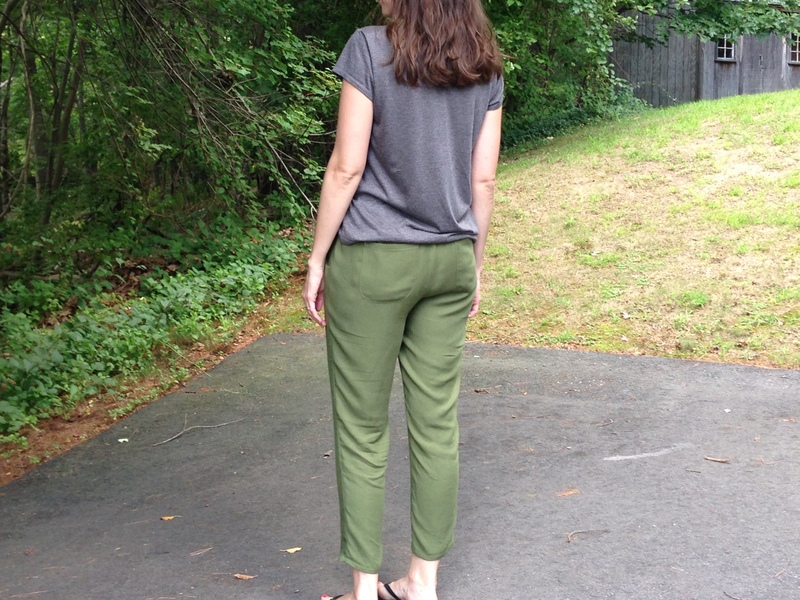 Oh I love a solid olive green for pants! These do look really rather lovely, even with the slight bagging out (which one probably wouldn’t notice much in real life because you’d be moving?) The fabric sounds like it would be lovely against the skin – shame about the fit when needing to sit down! I like the trousers, I’m thinking of making the Guise Pants, am tall like you so maybe I should lengthen them a couple of inches, good to know. It’s really helpful that you talk about the sizing, thank you! If you wanted to lengthen them, maybe you could add a cuff at the hem? Very on-trend, in fact I am pretty sure I’ve seen very similar pants in olive green rayon twill at Target. Glad you were able to fix the rise situation – it really bugs me to leave a project unfinished as well, so i understand! I’m really glad you were able to salvage this project. I think this silhouette looks great on you, and even though it was a pain to work with, the drapey rayon looks so cool. Great work – the end result is worth your extra perseverance. I totally know what you mean about sewing with rayon twill. I made a scout tee in shifting rayon and it was a pain to cut and sew! I think this looks really fabulous on you. Rayon twill can be a pain to work with. I have some waiting in the wings but need to be mentally prepared when I tackle it! I have never made the scout tee but I see a lot of them. I can see why it would be a favorite! Ah, too bad the pants aren’t perfectly comfy… they really look good on you. Your t-shirt neck binding method is my favorite, too, but I’ve only tried it for narrow SAs -yours looks great! I’m going to give it a try at 1/2″ next time. These pants are incredibly cute but the whole restrictive while sitting thing would be a big problem for me too. And that tee looks like the comfiest thing ever — Scout is an amazing pattern! 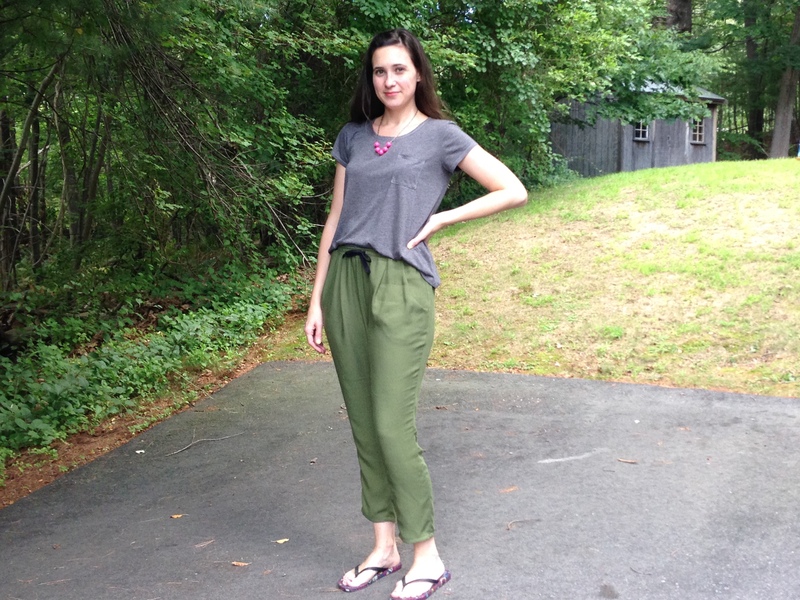 These pants keep coming up in my blogfeed and I am starting to fall in love with them. You version are just gorgeous. I love the olive colour you have chosen. It is a shame you aren’t lovely them. Hopefully they grow on you! I think these both look great! I made the Hudsons recently in a woven, and found the same thing with tightness in the thighs. It’s not terrible, but I think I could have used a little more room. Your scout tee is awesome! Love this, even if they are a bit tricky to wear they look great on you. This is the kind of go-to thing I wish I had in my wardrobe.